Have you ever wondered where writers of historical fiction get all their background information from? You know, about places, historical figures or events, customs, culture, and cuisine? I’ve always been fascinated by the process of writing, but even more so when it comes to historical fiction. On top of the usual challenges of a plot, character development, and pacing, historical fiction throws up the added hurdle of authenticity. To be credible, the writer has to get the history right and make the backdrop seem believable. So, wouldn’t it be great to be a fly on the wall and see what goes on behind the scenes while the writer is trying to craft all this? Well, it turns out that we can almost do that — the next best thing to being there is to hear how writers do it, in their own words. Lindsey Davis is the well-known creator of a series of historical detective thrillers set in ancient Rome, featuring Marcus Didius Falco, her wise-cracking, maverick gumshoe. She reveals her secrets to getting the history right, in the form of her very own top 10 list of the seminal resource books on ancient Rome in this excellent little piece in the Guardian newspaper. And Lindsey Davis should know — she has explored the seamy side of ancient Rome, warts and all, in books like The Silver Pigs and The Iron Hand of Mars (which we talked about in our podcast on the narrative voice). So, everything you need to write that next Roman whodunit is here — all you have to do is start. And if you have trouble getting started, here’s some excellent advice on that subject, too! Mystery novels have featured a variety of protagonists – almost every profession that we encounter in our daily lives shows up in mystery novels. I’ve read cozy mysteries that feature artists, bakers, caterers, cat lovers, dog walkers, flappers, police and private detectives and even wedding organizers – well, you get the picture. Historical mysteries are a little more constrained in how their protagonists make a living. Yet they too feature a wide variety of roles – detectives, doctors, historians, politicians, soothsayers, soldiers, and spies – despite the constraints of history. 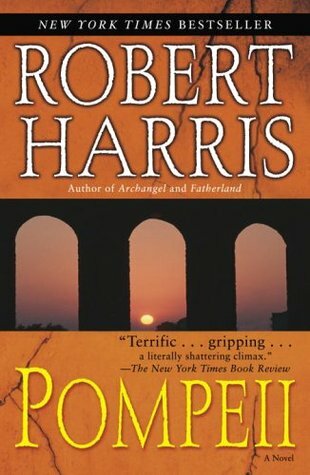 Robert Harris’ Pompeii is probably the most well-known mystery to feature an engineer as its protagonist – the young Marcus Attilius Primus. The story begins with a simple tale of an engineer being despatched to solve a technical problem – not unlike one we’d encounter ourselves after a particularly violent storm or hurricane. Water supply to the greater Naples region is affected as springs run dry and the engineer in charge of the aqueduct has disappeared. Of course as modern readers, we know – whether we are aware of it or not – that Mt. Vesuvius is about to burst to high heavens. Harris does a great job of building up the story, from what starts off as a simple municipal service problem that a maintenance engineer could address, to both a tale of political intrigue and nature about to let lose. The book does a great job of explaining the engineer’s role in those times. More importantly, it brings to fore the critical role that engineers played – be it laying the roads, or building the aqueducts – that allowed the Roman empire to not just grow, but thrive. The next engineer I encountered was also one troubled by the impending explosion of Mt. Vesuvius in the short story collection Pompeii — A Day of Fire. We’ve written about it earlier in prose and in verse. The focus in this tale is on the human end of things – how his unwilling bride re-assesses our engineer hero, who’s not only older than her but seems unromantic – in light of his actions even as the world they know seems to be ending in fire and brimstone. It’s a short but sweet rendition of engineer as human. However, Thomas K. Carpenter goes one step further, building an entire 7-book series – Alexandrian Saga. Featuring Heron of Alexander – who’s widely believed to have invented the first steam engine in the 1st century CE – the series suggests that it is actually his twin sister posing as him. Carpenter has him/her solving a variety of problems that have vexed mankind since then, starting with who might have burned the Great Library of Alexandria. Carpenter has also written a short story, The Virtues of Madness, where he shows how Temple “miracles” were performed thanks to engineers such as Heron. The use of war machines, the building of roads, temples and major civil projects, many of which stand to this day, meant engineers played a big role in historical times. And they are beginning to get their due, none too soon, in historical mysteries too. Tell us about your favorite engineer or other professions in historical mysteries! There are books and movies in which the place – the setting of the events – is as much a character in the plot as the main players. Think of London, in the Sherlock Holmes stories, or New York in Woody Allen movies. But there are also many other examples, where the atmospheric sense of the story would simply dissipate if it were set somewhere else – Barcelona in Carlos Ruiz Zafon’s Shadow of the Wind, Savannah, Georgia in John Berendt’s Midnight in the Garden of Good and Evil, or Los Angeles in Walter Mosley’s Devil in a Blue Dress (or really any one of his books featuring Easy Rawlins). You get the idea – location can be a crucial element of a story well told. I was thinking about this the other day, and it struck me that it would be an interesting exercise to look at places in the world that are compelling or unforgettable in ways that would make them a prime candidate for being a character in a novel. This is completely subjective, of course (that’s what makes it fun, right? ), but the first name that popped into my head when I came up with this idea was Venice. What other city can one think of that almost invites mystery and intrigue into it, as though to say, this is the offspring that I am destined to nurture in my womb? Think about it – this is a city that sits atop over one hundred islands on a marshy lagoon in the Adriatic, has no cars or roadways, and yet has a rich cultural, political and artistic heritage stretching back over more than a millennium. It’s barely a quarter the size of London but has over 400 bridges. The main means of transport is by boat, yet it has a maze of streets, including one of the tiniest in the world, a mere 53 cm wide. Houses are numbered by district, not according to the street, which makes it so confusing that even the mail workers can’t figure it out. This is the city of carnivals, masked people, and acqua alta (the high tide that floods the famed Piazza San Marco). What an ideal setting for murder, mayhem, conspiracy, and subterfuge! And to my immense gratification, Venice does not disappoint, at least in this sense. I did not have to wander long in my trove of mystery and historical fiction to discover a rich vein of material set in this City Most Serene (a clever façade, if ever there was one). Let’s start with Donna Leon and her series of contemporary police procedurals featuring Commissario Guido Brunetti. These are all set squarely and unapologetically in Venice, a city, which ironically (according to the author) boasts “very little violent crime.” Death at La Fenice, for instance, chronicles the death by cyanide poisoning of world-famous conductor Helmut Wellauer during a performance of La Traviata at the famed opera house, Teatro la Fenice. The New York Times Book Review calls the book a “stunning procedural which lures us away from the glittering Rialto into the working class heart of Venice.” Another review gushes about how Leon has spun a “challenging mystery, a sophisticated drama, and a unique glimpse of a medieval society that still flourishes.” As a complete aside, Donna Leon, for those of you who care for that sort of thing, is on Hillary Clinton’s reading list. Venice and La Fenice again feature in John Berendt’s City of Falling Angels, which weaves an intriguing tale around the real-life fire that almost completely destroyed the opera house in 1996. In his trademark atmospheric style (very reminiscent of Midnight in the Garden of Good and Evil), Berendt evokes all the magic, mystery, and decadence of Venice in this story, filled with richly detailed characters and enough plot twists to fill, well, a John Berendt novel. Not unexpectedly, given its medieval and mystical flair, Venice also makes a prominent appearance in one of Dan Brown’s thrillers, Inferno, where it’s home to a particularly significant plot point and the eventual denouement. And finally, just to tread a little off the beaten path, here’s a work that doesn’t quite fit neatly into any one genre, but is a hidden gem in its own right – Invisible Cities, by Italo Calvino, which is a fictional depiction of the encounter between Marco Polo and Kublai Khan. Calvino is sometimes spoken of in the same hushed tones reserved for the likes of Umberto Eco, so he’s no lightweight when it comes to spinning a yarn with a delicate balance of literary heft and popular appeal. Invisible Cities has all the magical realism, historical detail, and romantic fantasy that a city like Venice deserves. Even Kublai Khan ultimately realizes that every fantastical place that Marco Polo describes in their encounter is some version of the Venice he loves. And what more can a city ask for, than to become a character in a novel? Small wonder then, that Wales has its share of historical and archeological enigmas, to embellish this general reputation for the peculiar. While other parts of the world have their crop circles and their Stonehenges, Wales has its hillforts — strange man-made Bronze Age constructions that are as inexplicable in their design as in their density. A mere 150 square mile area in northern Wales, for example, has no less than 30 of these formations, whose size and shape continue to baffle present day archeologists. At first blush, they seem to be conventional fortifications, situated on hilltops to provide the advantage of higher ground against the enemy. But their size begs the question of how they would have been defended — and the type of crude weaponry available in those times equally raises the question of why they would have needed much defending in the first place. Perhaps these hillforts were settlements intended to provide clans and tribes with a secure place to live and store grain for parts of the year. Or perhaps their locations (vantage points over the valley) were emblematic of a power structure within those tribes and clans — the occupation of a hillfort being a status symbol in the hierarchy of those groups. Many of these Welsh hillforts are yet to be thoroughly excavated — so perhaps with more archeological activity over the next number of years, we may start to get some answers to these questions. In the meantime (as we wait for these questions to be answered), it turns out that there is a considerable body of writing to keep us occupied, featuring Welsh mysteries of the fictional kind. Given Wales’ reputation for everything from the merely puzzling to the ghostly to the downright sinister, writers of historical mysteries have not lacked for enthusiasm in setting their thrillers in uniquely Welsh locales. Sharon Kay Penman‘s series on Welsh princes is set here, as are some of the stories in Ellis Peters’ Cadfael chronicles. Mary Stewart‘s series on Merlin and the Arthurian saga is, of course, set in Wales as well. Candace Robb‘s historical sleuth, Owen Archer, is a Welsh spy who plies his trade in medieval York. Sara Woodbury‘s medieval mysteries (featuring her protagonists, Gareth and Gwen) are set in northern Wales. In fact, the first book in the series, The Good Knight, is currently available free on Amazon. So Wales, in short, has much to offer to those of us who congregate at the crossroads of history, mystery and writing. Given what a difference backdrop and atmosphere can make to mystery fiction, it’s not difficult to see how Welsh locales can add a touch of the creepy and the ominous to the historical page-turners we love to read. Check out some of the recommended readings in this post, and let us know what you think! Our minds often work in strange ways, flitting from one thought to another, like bees seeking nectar — and then not even dwelling on one long enough to extract anything from it. Or maybe it’s just me. I was just thinking earlier today that it’s about time we did another post on what we are reading these days. That got me reflecting about Mary Beard’s The Fires of Vesuvius, which in turn reminded me of our post on Pompeii, our review of Pompeii: Day of Fire, and our subsequent podcast on a related theme. Somehow or the other, that whole thought process led me to this charming little article on one of the characters in that collection of stories — the Aedile Pansa. Such are the little delights one finds in wandering the garden paths of history. Or perhaps this is merely an interesting footnote on a real inhabitant of a little Roman settlement that was wiped out in the eruption of Vesuvius in AD 79. I’ll take either interpretation — but more importantly, what do you think? It was the fall of 1932. Like most everybody else around me, I was caught in the dust storm of despair that the history books call the Great Depression. Back then, I don’t know if I had a name for it. It was just life, or whatever life had been replaced with by some fearsome power that I couldn’t see. Anyway, like I said, it was an autumn day, and I was trying to sell apples at the corner of Spruce and 18th near Rittenhouse Square in Philadelphia. I had a sack half full of them, all picked off the ground from one of the farms on the northeast side of town. I don’t know what I was hoping to do with my sad sack of apples. Every face that passed me had the same expression, a mixture of defeat and desperation, searching anxiously for something with the certainty of knowing it will not be found. I knew that look – it was the same face that sometimes stared back at me in the cracked mirror they had in the poorhouse on the other side of Market Street. Then suddenly, in the middle of that line of shuffling souls, a man appeared. It was impossible to miss him. It was a cloudy, overcast autumn day, but he walked down the street like a ray of sunshine, with his fine hat, his pressed suit, and his shiny shoes. Before I knew it, he was standing in front of me, as though I was just the person he had walked down the street to see. Three dollars. That was more than a whole day’s wages back when there were wages. It was more than I had earned in any day in the months since I had arrived in Philadelphia on a boxcar from Cincinnati. If it wasn’t for his fine clothes and that strange, serene look in his eyes, I might have taken him for one of those joes that rags on you just to make you feel worse than he is. Like a few of the hobos I had sometimes run into on my boxcar journey across the midwest. But this man was no hobo. I handed him the sack without a word. The clink of the three dollar coins he dropped into my outstretched palm was sheer music. Then he was gone. That night, on the other side of the railway tracks, we had a grand time, me and my little community of fly-by-night buddies. There was Jake, the farmer from western Pennsylvania, who had skipped town to escape the loan payments he could no longer keep up with. And there was Tooth, an old man with thinning yellow-white hair and several missing front teeth, who was always talking about some woman he was with during the World’s Fair in Chicago. The three of us were the regulars, men who had bummed around together at one time or another during our sojourn in Philadelphia, city of brothers. And then there were a couple of professional hobos whose names I did not know, but whose faces looked as familiar as the next fellow. We passed around a flask of rye whiskey making sure the three of us got our swigs before it went around to the hobos. Our command of the flask was our way of showing how we, the regulars, were superior to them. The burning liquid warmed our chests, the laughs coming out of our throats, but not able to reach our eyes. Jake started talking, as he often did, about the letter he wrote to Governor Gifford Pinchot, the letter he always carried in his pocket like an old photograph. Written in pencil on yellow ruled paper, its creased pages had been folded and unfolded many times, recounting his hardships on the farm and asking for relief. In the many boozy readings we had heard from Jake, not once did any of us have the courage to ask why he never mailed it. “Did you know,” he asked, one eye glinting with secret knowledge, “that our great Commonwealth has a Director of the Poor?” The question went unanswered. We had heard this many times before too. One of the hobos then chimed in, talking about some swell in a felt hat who was handing out apples from a sack to the people in the bread line at the poorhouse on Arch. That caught my attention. “What’s the good of that?” the hobo wanted to know. “Why do you think those folks was standing in the bread line? What’s the good of handing out apples to a hungry man?” This started a lively debate among the regulars, who became concerned with the relative value of apples over bread to the hungry on the street. The argument then became quite heated when everyone realized that the last few drops of whiskey were gone. My curiosity was aroused, but my questions fell on deaf ears. “What did he look like? Was he wearing a pressed brown suit and shiny shoes?” I wanted to know. But no one showed any interest. My eyes drifted to the night sky, its vast space dotted with little fireflies of light. The rye whiskey was snaking its way through my brain as images of a radiant young man in a felt hat and a brown pressed suit and shiny shoes floated past my eyes. As the fireflies starting fading out, I could see him coming towards me like a ray of sunshine, and I could sense a forgotten feeling start to creep back into me, a feeling I hadn’t had for so long that I didn’t know what to do with it. My last thought as I drifted off to sleep under the stars on that autumn night in 1932, was one tiny little word: hope. An earlier version of this story appeared on Ramesh’s blog at writefulblog.wordpress.com. When my friend Srikrishna and I started this blog, we were largely motivated by our shared interest in history and crime fiction, and a gravitational attraction to good writing. So the tagline for our blog required almost no thought — anything other than “Exploring history, mystery and writing” would have seemed absurd. In hindsight, I wish I had resisted that urge to commit so early in the game — because it’s clear to me now that I should have held out a little longer, to find some way to sneak “food” into the title. Over time, I found little ways to make up for that momentary lapse of judgment — by weaving in mentions of food into our podcasts, and writing the occasional blog post featuring cuisine from antiquity. But somehow, none of that ever seemed enough — and matters eventually came to a head yesterday when I was listening to one of my favorite podcasts, Stuff You Missed in History Class. Hearing the hosts, Tracy and Holly, talk about the history of pizza, finally sent me over the edge. There is absolutely no way my name is going to be associated with a blog site related to history, without food taking center stage. Not on my watch. So here we go, with a question I should have asked, well, a long time ago: when did we start making and eating food? No, don’t laugh. It’s a serious question, deserving of more thoughtful answers than “Duh, we killed and ate the animals we hunted.” Fortunately for all of us, this is a subject of deep inquiry — food history is a legitimate field of study in its own right, which examines not only the history of food, but also the cultural, social and economic impacts of food through the ages. Just the sheer number of questions that food history attempts to answer is impressive. When and why did humans start cooking food? How did our ancestors know what to eat and what to avoid? Who came up with the first recipe? What is the origin of some of the foods we take for granted today? When were eating utensils invented? What is the origin of table manners (or lack thereof)? Fascinating as these questions are, I doubt that many of us (including me, I’m ashamed to say) necessarily want to spend the next few years wading through the many thousands of pages that food historians have compiled. The key here is strike a balance between satisfying our curiosity and not spending so much time on the history that it affects our culinary pursuits in the present. So here’s what I think is a carefully calibrated compromise. I have compiled a set of resources below, for your reading pleasure. Before you start skimming (or clicking) through them, make sure to set yourself a sampling table of your favorite victuals and libations to accompany you on your quest. The Food Timeline – an online resource with links to the answers to many of the questions we raised here, along with a timeline of significant food “events” from prehistory to modern times. Food: A Culinary History from Antiquity to the Present — everything from the evolution of food habits to social and agricultural practices, to religious beliefs and dietary rules, to the origin of pasta and chocolate. Food: The History of Taste – what is food, if we don’t understand how tastes have evolved from antiquity to the present day? From our earliest proclivities for the sweet and the fatty to our acquired sensibilities for spice, nuance, and subtlety — this well-researched tome has it all. Hungry History – a delightful collection of vignettes from the History Channel on topics ranging from how the tradition of cookies and milk at Christmas originated, to the history of Tex-Mex cuisine, to the backstory of the humble pickle. The New York Public Library’s Culinary History Section – no self-respecting listicle on this topic can be complete without this comprehensive resource. The history of everything that is anything to the palate — from baking to condiments to wine-making to gastronomy, with pointers to encyclopedias, reference books, collections and scholarly articles on the subject. And, lastly, just to show how genuinely interested we are in dragging you kicking and screaming into this subject, here’s a recent article in the Washington Post that explores the relationship between food history, politics, society, and the rise and fall of civilizations — all in the context of the ordinary potato. Consider this our bonus 6th item in the Top 5 list! One final bit of advice: sample this topic the way you would a well-prepared meal. It’s all about tasting, savoring and appreciating what’s been laid out for you. It’s not about stuffing your face, although you are totally free to do that if that’s what you’re into.